A l’occasion de la sortie de son premier album sur son propre label Sincopat, le DJ et producteur espagnol nous a accordé une interview. Nous avons voulu savoir qui se cache vraiment derrière ce pseudonyme et c’est avec un certain bonheur que nous avons eu l’occasion de découvrir quelqu’un d’accessible et très ouvert d’esprit puisant ses inspirations au quatre coins du monde. De Berlin à Valences en passant par Cuba, AFFKT nous propose un véritable pont entre les cultures. For your listeners, who don’t know you yet, could you introduce yourself in few words? My name is Marc also known as Affkt and I like to make different kinds of music, produce music that really touches your heart. Sometimes it’s dance music, sometimes it’s not. 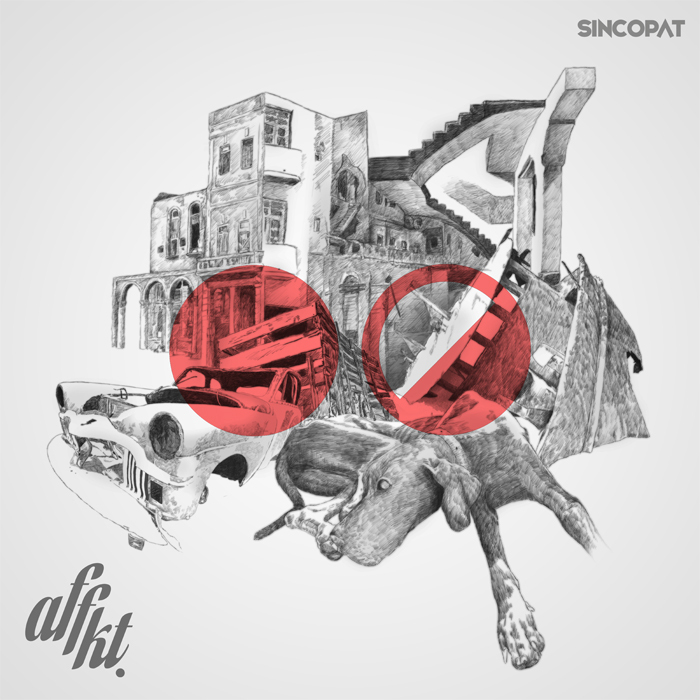 A lot of people don’t know if we must say « AFFEKT » or each letter of the alias « A[ei]/F/F/K[kay]/T[tii] » What’s the meaning of your artist alias « AFFKT »? It’s a name that may be interpreted in different ways. Personally I’m a very sensitive person and influenced by many things that surround me, such as my music. What are the key moments of your career before the release of your first album? We will talk about it in few minutes. This is not an easy question, there have been so many good moments up until now, I have been able to travel and meet interesting people. I guess we would need 2 days for me to explain every moment. Before speaking about your album, let’s talk about you as a « DJ ». Do you prefer Live or DJ Set? It’s difficult to say, when playing live it’s my own music so it’s easier to get into my world and there’s also the whole creative process of making music in the studio and with other artists, but then DJ-ing allows you to play longer and play music made by other artists so it’s not easy to choose. You also have a new live with your singer Sutja. Could give us a little more information about it? I actually met him a few months ago when he was playing before me and we spoke and I was really impressed by his playing and singing. So we kept in touch afterwards and I decided to make a track with him. We first did something for advertising, I sent him a track and he put lyrics on it. Then we became really good friends, we made some more tracks and I also started producing his album which is more pop-electronic oriented. His voice really fits into my music and we are currently working on a live together. In the past, you have worked with some great labels like Suruba, Suara or Rebirth but you’ve also created your own imprint, Sincopat. Why do you want to have your label? Actually, Sincopat is not my first label, in the past I put a lot of work into Baracca but then I felt I should tell my story in my own way so I decided to put it all behind me and start a new label Sincopat. To me creating your own label makes me believe you can bring something more to the music scene. Sincopat also has a credo: every release we bring has one sound of the former release in it which makes it special. Why did you call the first Sincopat release « Once Upon A Time »? Your fairytale comes real? Because it’s sort of the beginning of something special, a whole new story just as explained with our credo. To speak a little more about your album, you released your first album last February. Why did you wait so long to release a first album? Someone once told me: « you have your whole life to release a first album but only one year to release your second album » so I didn’t really plan it, it just happened when I traveled to Cuba and met some great people there. Why did you call it « Punto 0 », is there a special meaning? That’s a funny story, when I was in Cuba I asked someone « where did Fidel Castro live? » and he told me « Fidel lived in a place called Punto Zero » and no-one really knew that which is kind of similar to my story because I went there to find my musical roots without really knowing what I would discover. In your album, there are a lot of influences and sounds from different areas in the world? Especially from Cuba, do you have a special connection to this place? To me the music there has African and Caribbean roots and everyone told me it would be great to go there and be inspired by all that. I tried to not make the album sound too Latin but mostly to find the essence, a beat. There are also different collaborations on your album? How do you meet those guys and how do you create those tracks? Every collaboration was made in a different way, sometimes via the internet, sometimes live, I feel really proud of having had the chance to work with great producers and they taught me so much. I will give you three tracks of your album. Could you tell us the story behind them? I was not feeling so good when I made this track and the voice comes from a hip hop singer mixed with African music, it’s a special track to me. The first track I ever made many years ago when living in Munich and I felt my first album should have at least one track from those first years which I reworked so it was like remixing myself. The track reflects how I was feeling back then. I started making this track in Berlin but reworked it when coming back from Cuba in Valencia (where I live) it makes me feel good, I’m kind of in my imaginary place. Did you also create a documentary about your album? Do you want to show to the people where your inspiration comes from? I told a friend of mine I was going to Cuba and he said it could be a good idea to make a documentary but we knew it would be difficult to go there and record something because the government doesn’t like it there so we wondered what to do and then we found a small HD camera and we went there and we just filmed a whole lot. To me it was more paying a tribute to the Cuban people instead of a story about myself. You also told me there is a future « Remixes Album »… could you already give us some more information about it? We have 14 remixes, it was very interesting to see how others see and feel your music and how they remix it. Part one releasad mid-May, part two end-June and normally, part three will be released mid-July. What kind of advice could you give to young DJ or producers? Try to be yourself and be honest with yourself because if you do that your music and sound will always be honest.